The stirring story of the Wright Brothers, plus a colorful supporting cast of high-flyers during the baby-step era of aviation, entertainingly presented—warts and all. And warts there were. These were men cast in the heroic mold, ferociously determined, some of them brilliant, all of them capable of jaw-dropping acts of small-mindedness, backbiting, bad faith, and out-and-out chicanery as they chased that aeronautical Holy Grail: the solution to the problem of “manned heavier-than-air flight.” Intensely competitive, they shunned collegiality, each desperate to be history’s darling. Any breakthrough by a rival was either minimized or blatantly appropriated. The Wright Brothers, no less driven than the rest, were clearly better behaved. Proprietors of a modestly successful bicycle business, they sort of slid sideways into flying when Wilbur’s avocation—building a motor-driven plane—suddenly flared into a passion. As younger brothers often do, Orville trailed along, but both men began to think of success as a way to escape Bishop Milton Wright (of the United Brethren Church), their bullying, domineering father—the sky a place, perhaps the only place, beyond the reach of his tyranny. 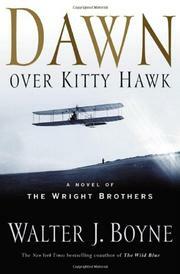 In 1900, Wilbur took his embryonic airship to Kitty Hawk for the first time. Three years later, the Flyer, the brothers’ elegant, beautifully crafted plane, stayed up for 57 seconds—under a minute, but it was a flight heard around the world. At a cost of $880, plus living expenses, two young men in their 30s, neither college-educated, had accomplished what no one else had and what most people firmly believed was boys’-magazine fantasy, becoming, almost overnight, international icons. Though occasionally more generous with detail than is good for narrative momentum, Boyne (The Two O’Clock War, 2000, etc. ), does the novelist’s job well—converting the iconic brothers into appealingly quirky humans.